When you get off of the Ferry follow the road to the intersection of Route 2; you will see the Mobil Station and McKee’s Pizza on the right. Turn right and continue East on Rt. 2 for about .8 (eight tenths of a mile). Watch for Sunset View Road on your right, take this right and continue 7/10 mile, Camp Ta-Kum-Ta’s entrance is on the left. Continue North from Burlington on Interstate I-89 and travel 9.2 miles. Take Exit 17, bear right and merge onto Rt. 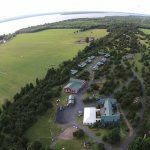 2 West toward the Champlain Islands, travel 9.8 miles. Turn left onto Sunset View Road, this is the 3rd left after passing through the (small) village of South Hero – don’t blink! 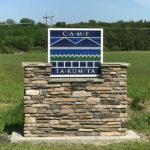 Continue 7/10 mile; Camp Ta-Kum-Ta’s entrance is on the left.